Image: File photo shows Secretary General of the Shanghai Cooperation Organization Dmitry Mezentsev. Secretary general of the Shanghai Cooperation Organization (SCO) says recent conclusion of Iran’s nuclear talks with the six world powers will pave the way for Tehran’s full membership at the organization. Speaking to IRNA on the sidelines of a forum of the heads of the leading SCO media outlets in Moscow on Tuesday, Dmitry Mezentsev explained about the positive effects of the recent nuclear agreement clinched by Iran and the P5+1 group of countries in Vienna on July 14. Mezentsev said “Iran’s full membership in the organization has not been possible so far because of the sanctions” imposed on the country by the United States and European Union over Tehran’s civilian nuclear program. “However, this obstacle has been removed now,” he added. Sanctions were imposed on Iran by the US and EU at the beginning of 2012, alleging that there was diversion in Iran’s nuclear program toward military objectives; an allegation that Iran categorically rejected. On July 14, Iran and the P5+1 group – the US, the UK, Germany, France, China, and Russia – reached the conclusion of negotiations over Tehran’s civilian nuclear program, with the Islamic Republic and the sextet sealing an agreement. According to the agreement, known as the Joint Comprehensive Plan of Action (JCPOA), all economic and financial sanctions against Iran will be removed. In addition, all bans on Iran’s Central Bank, shipping, oil industry, and many other companies will be lifted. The official added that after the implementation of the JCPOA begins, the SCO will put Iran’s membership request on its agenda and the country can become a full member of the organization. 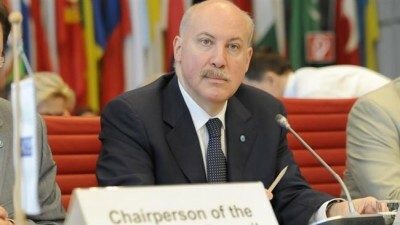 Mezentsev stated that cooperation between the Islamic Republic and the SCO covers all levels, including ministerial level and among secretaries of the member states’ national security councils, and the cooperation will increase once Iran becomes a full member. At present, the Shanghai Cooperation Organization has six permanent members, including China, Russia, Kazakhstan, Uzbekistan, Tajikistan and Kyrgyzstan. Iran, India, Pakistan, Afghanistan, and Mongolia are observer states of the SCO while Turkey, Sri Lanka, and Belarus are “dialogue partners” of the organization. According to Russia’s Sputnik news agency, the event, which is organized by Rossiya Segodnya and Russia’s Federal Agency for Press and Mass Media, is attended by representatives of the Xinhua news agency (China), IRNA (Iran), TRT (Turkey), Kabar National News Agency (Kyrgyzstan), Khovar National Information Agency (Tajikistan), RTRK Kazakhstan, and India Today Group.